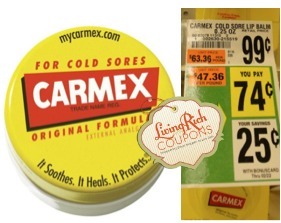 Carmex Lip Balm Only $0.24 at Giant! Giant Shoppers, you can score Carmex Lip Balm for just $0.24 each through 2/22! This lip balm is on sale for $0.74 and there is a $1/2 Carmex coupon from the 1/5 Smart Source insert making these lip balms only $0.25 each when you buy 2. Can’t have enough lip care in the wintertime! Be sure to check out the rest of the Giant Deals for the week before you shop.